The Yellow-rumped Cacique is a very attractive and gregarious bird—at nearly a foot in length, it is a large member of the blackbird family. Like other caciques, it has mainly black plumage and a large, pale bill; it shares the Scarlet-rumped Cacique’s pale blue eyes. It has a bright yellow lower back, rump and vent, with yellow “epaulets” or shoulder patches. Males and females have similar plumage, although the male’s plumage is brighter and the male has a short, thin crest. There is a pronounced size difference between males and females—males are significantly larger than females. Juveniles have dark eyes and a brown bill base. Yellow-rumped Caciques can be found in the middle and upper levels of forest, woodlands and open areas with large trees, riversides and along lakes and fields. They are a lowland species, found from sea level to 700 meters. They are very social and garrulous birds; they forage in groups and nest in colonies, often with closely-related oropendolas (especially Chestnut-headed Oropendolas). Yellow-rumped Caciques feed on insects and fruit, also nectar and seeds. They are often detected by their calls, giving a wide variety of vocalizations including liquid whistling, burbling calls, churrs, squeaks and ear-piercing sharp notes. On occasion, they will even mimic other birds. Colonies share 5-7 song dialects which vary colony to colony. Their vocalizations also vary geographically. Males are territorial and counter-sing to establish dominance. Read more about the Yellow-rumped Cacique’s complex vocalizations and interesting vocal facts here. The Yellow-rumped Cacique has three recognized subspecies. Yellow-rumped Caciques are polygynous, meaning males mate with multiple females; thus, females are responsible for building the nest, incubation and caring for young and males take no role in any aspect of parental care. 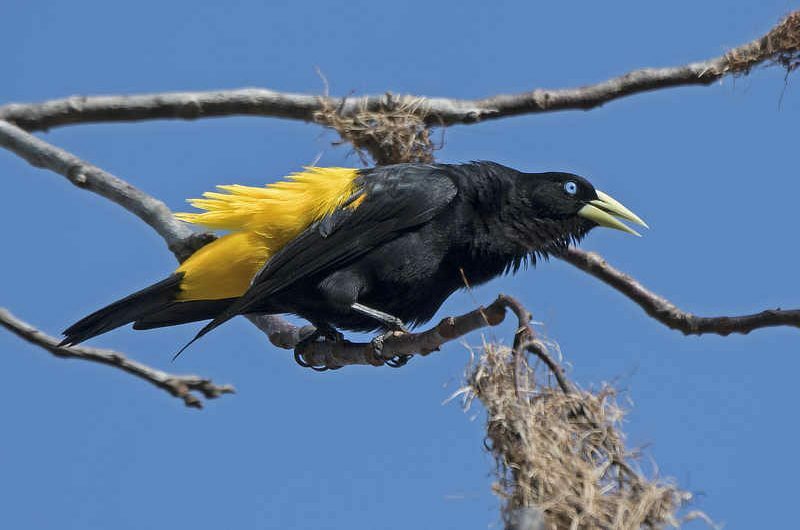 Yellow-rumped Caciques make complex, hanging woven nests, 30-45 cm long and pendular-shaped, similar to those of oropendolas but shorter and more oblong. Nest building takes 8-20 days. There is much competition in colonies for optimal nesting sites, copulation with females and singing perches for males. In colonies, nests are often tightly clustered together, even to the point of touching each other. Breeding colonies can contain 2 to 250 nests. Females lay two pale blue or white eggs blotched with dark markings, and incubate the eggs for 13-15 days. Chicks fledge at approximately 25 days old, and usually only one chick fledges successfully. Nesting colonies often contain active Polistine wasp nests—being in the proximity of a wasp nest offers protection from botflies and mammals. Predation at nesting colonies does occur, and there are a number of predators known to attempt nest attacks, including capuchin monkeys, snakes, toucans and Giant Cowbirds (via nest parasitism). The Yellow-rumped Caciques avoid nest predation in three ways: by nesting on islands surrounded by caimans or in proximity to wasp nests as mentioned above, by clustering nests together and mobbing predators as a group, and by mixing active nests with abandoned nests to hide nests with eggs and nestlings and confuse predators. The Yellow-rumped Cacique is resident and widespread from western Panama to northern Bolivia and central Brazil, in the Amazon basin. In Panama, it is fairly common, and can be found around all the Canopy Family lodges.